Who says summer is a restful time? This summer (January and February) were packed full of events. We were definitely out of our routine! It started out with CAMPS in January. Our whole family usually does not help out during all the three weeks of camp, but this year, because of unforeseen circumstances, we were there more than usual, with Ben directing the last two weeks, and our whole family also helping in whatever needed to be done. It was great but exhausting. Kids and helpers from our church during the 12-14 yr. old camp. Then, after a week back home, Rachelle rushed off to a LADIES’ RETREAT on the west side of the country in the beautiful province of Mendonza. She had been asked to speak during the retreat, but also was able to enjoy the other speakers who spoke on the theme of prayer. At the end of February our whole family also attended a MISSIONARY and PASTORS’ RETREAT out at camp. What an encouraging time to share and learn alongside others who are in full-time ministry here in Argentina. The speakers at the Ladies’ retreat in Mendoza. Our first COUPLES’ EVENT took place in February, with a banquet. One couple in the church was in charge, and planned it all wonderfully! We thank God that 8 couples came to invest in their marriages. On another note, Rachelle’s paternal grandfather passed away at the end of February, and she flew up to Minnesota to be with her family for the FUNERAL. It was a sad, but also glad time for the family, as her grandfather, Oliver Courts, was a Christian and is now in heaven. Thank you to those who prayed! Photo op at the Valentine banquet. Guillermo and Mirta (pictured) planned it all. This December Rachelle was able to speak at our mother church’s Christmas tea, which was a blessing for her. We love to minister to other churches also, not only our own. We also culminated our WOMEN’s ministries by attending a special retreat at camp. Last year we had six women go, but this year we really pushed for more. Nine women were able to attend! They all felt blessed to be able to go and draw closer to God and each other. That is one thing that we have seen this year- our church family grow in unity. We praise God for this! Please pray it continues. We are also investing in our MEN. Ben teaches in the local Bible Seminary, and a couple of our men have been training in it. As a result, they are being included in the teaching and preaching. Guillermo is one of those men. It is a joy to see him grow and mature into a man who seeks God and loves his family and God’s people. He preached for the first time in church in December. He also leads a discipleship small group, and personally disciples 3 men. We praise God for him and for other men who are growing in their relationship with God. Please pray for the men of our church! Guillermo preaching in church for the first time. CHRISTMAS came just as it does every year, with new opportunities to reach out to our community with the Gospel. Our church prepared 20 food baskets for our own church members who are in need, and also for neighbors and friends our church members were thinking of and praying for. Please pray that God would keep using our church to reach our community with the good news of Jesus! We also had a wonderful Christmas service. There were many Bible readings & special music including our family, and a sweet song by the kids’ choir. 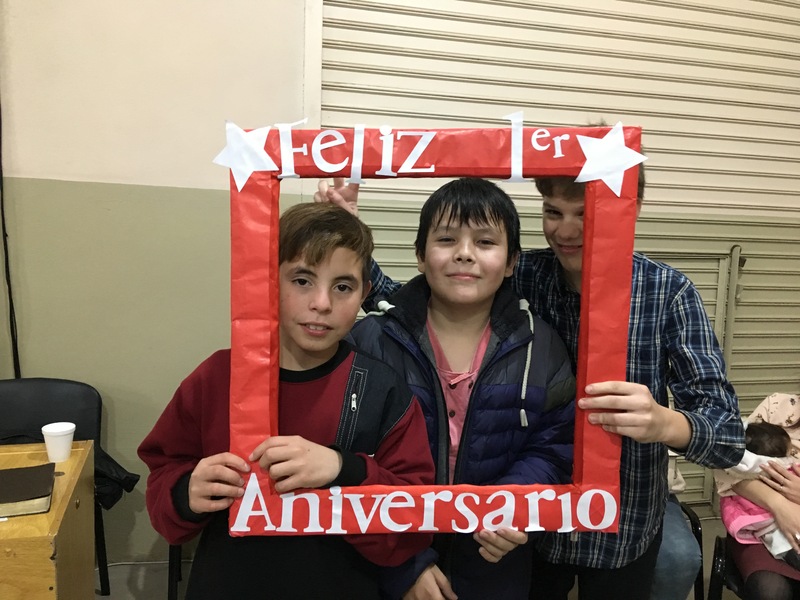 Our YOUTH GROUP has been expanding recently because of birthdays- kids can begin attending the youth meetings when they turn 12. 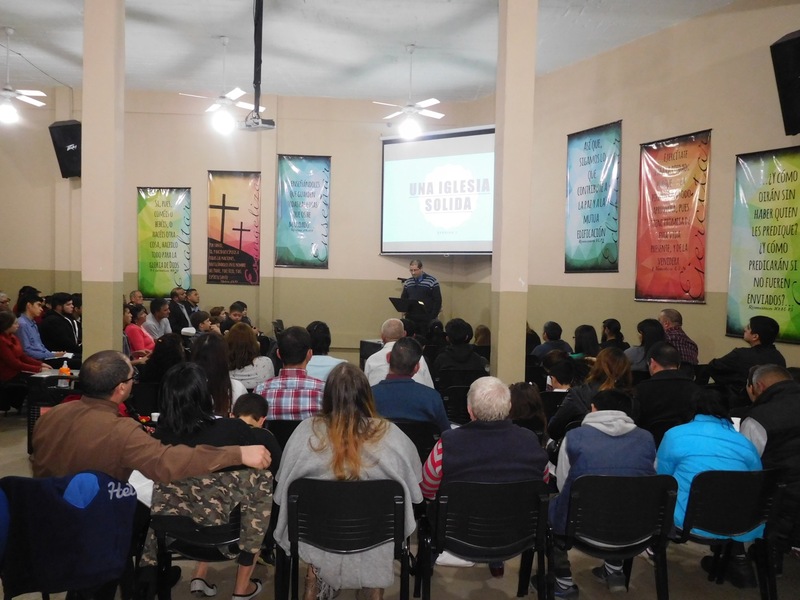 Our bi-weekly youth meetings have been increasing in number, and also in fellowship and camaraderie, which is very encouraging. Please pray for our youth. Many come from broken homes, come without their parents, or are simply struggling (as all youth do) to find their way in the world. 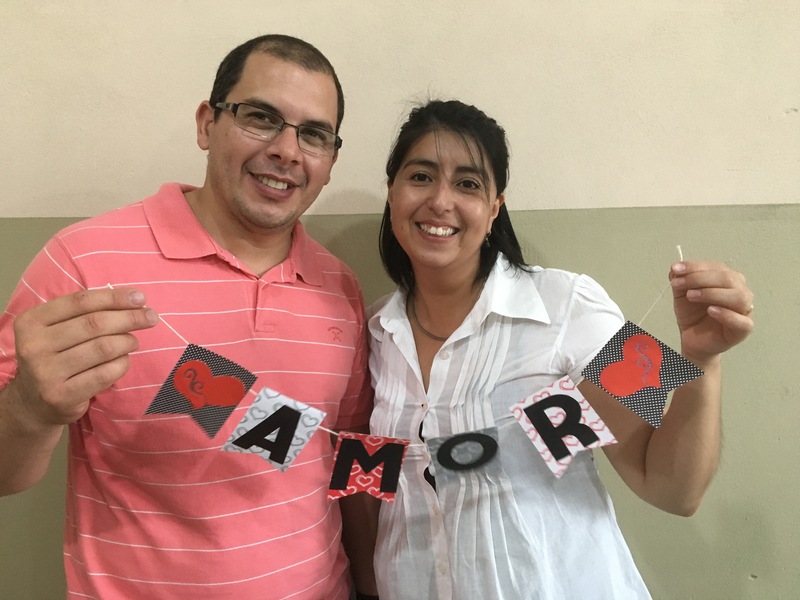 Also pray for Nahuel and Florencia, our youth leaders, to have the right words guide them spiritually. In July and August we celebrated two of our children’s BIRTHDAYS- Lucas and Natalie’s. They both enjoyed inviting friends from church and taekwondo to come for birthday sleepovers. 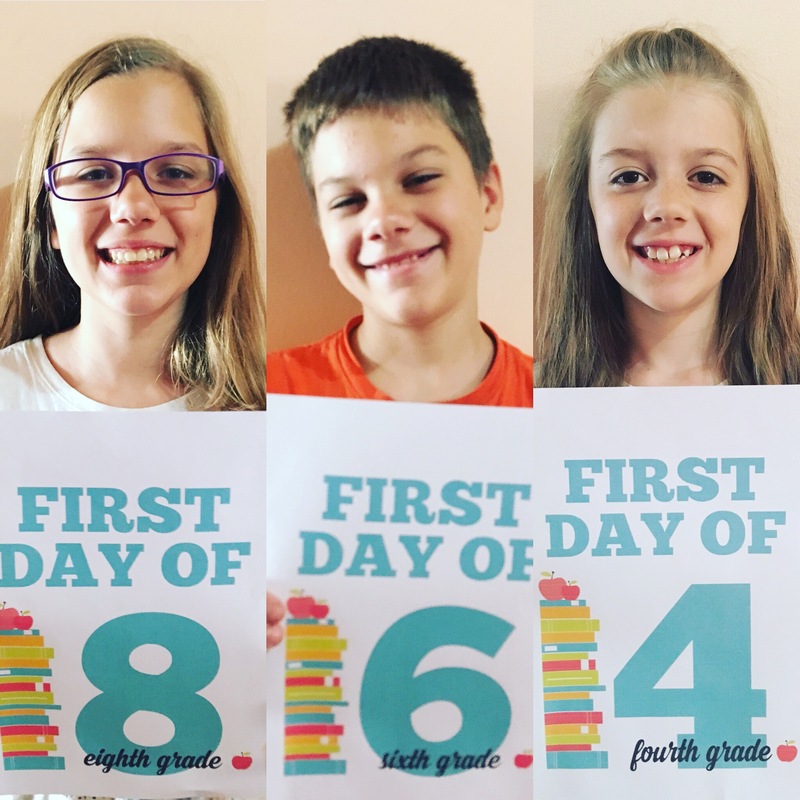 Two different birthday celebrations for two awesome kids! 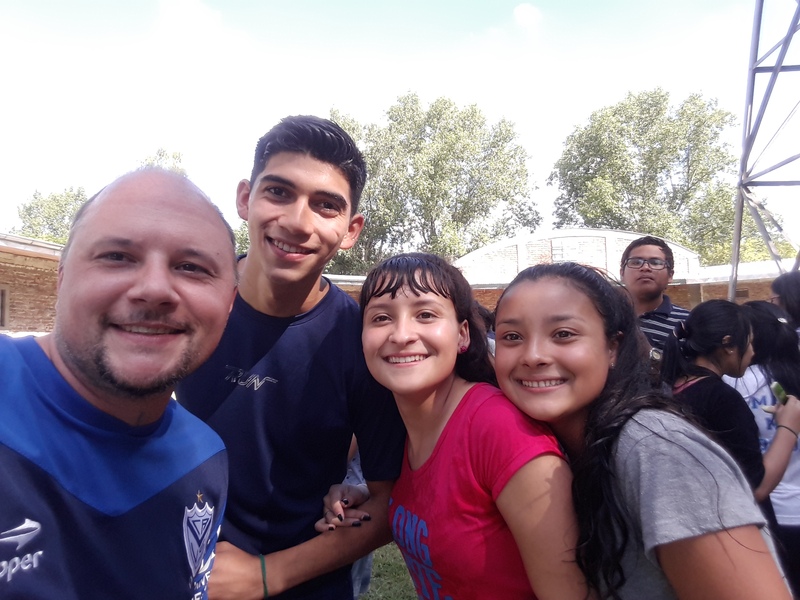 It is neat to see the friendships they are developing, not only with other Christian young people, but also reaching out to their unsaved friends. Please pray for their spiritual growth and testimony, and for their friends salvations and growth also. 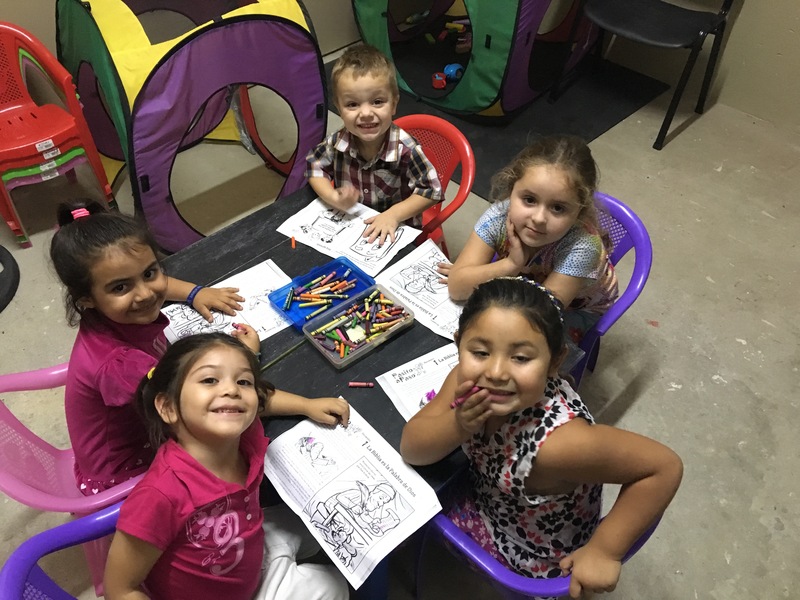 There are many things fighting against our children’s godliness, and more so here on the mission field. August is the month that hosts NATIONAL CHILDREN’S DAY here in Argentina! It is a wonderful chance to reach out to our neighbors with the Good News of Jesus! Our church held a “family celebration” for friends and family this year. We invited whole families to come and celebrate the day with our church family. Pictured above are some of those visitors. The theme for it was “Superheroes”. Everything revolved around teaching that Jesus is more than just a superhero- He’s our SAVIOR! Thank God for the many visitors who came and heard the Gospel message! Our new-to-us van! – Our old van needed the engine rebuilt, so with that and other factors, we realized we needed a different ministry vehicle- It is a 13 passenger- perfect for ministry! Thank you for your faithful giving which allowed us to save up to purchase this vehicle!!! 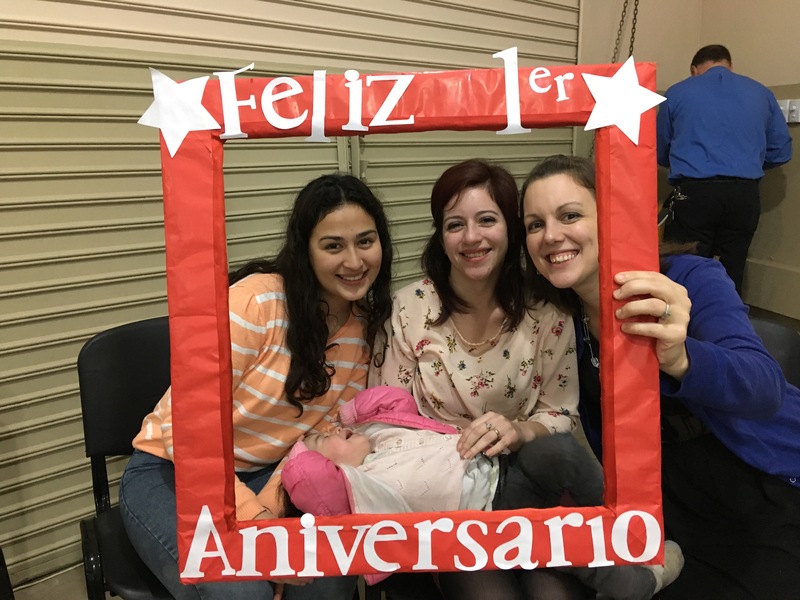 The most noteworthy event we have had so far this year is Iglesia Bautista Redención’s first Anniversary!!! We are truly blessed to be leading the special group of believers who God has led to congregate with us. The celebration service was a wonderful testament to the wonderful works which God has done this past year. We have been averaging in between 45-50 recently, but were blessed to have almost one-hundred come to help us celebrate this special day, including many first time visitors! Our whole church family helped in the preparations, which was a blessing. It is so impactful when the whole body joins together to serve each other and visitors who come in the doors of the church. Some of these visitors were the extended family members of Raquel, one of our church members, whose brother passed away suddenly. They have all been shocked by this loss and we are trying to minister to them during this difficult time. 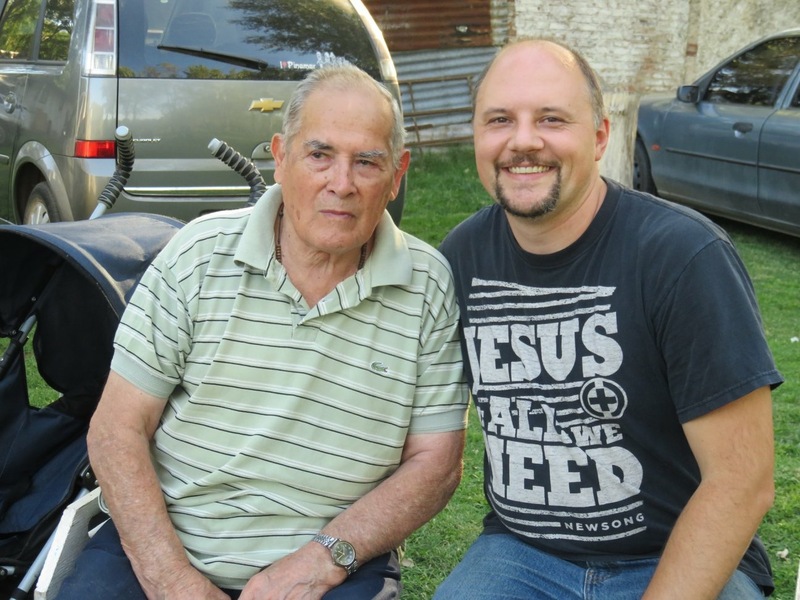 Please pray that the whole family would come to know Christ through this ordeal. 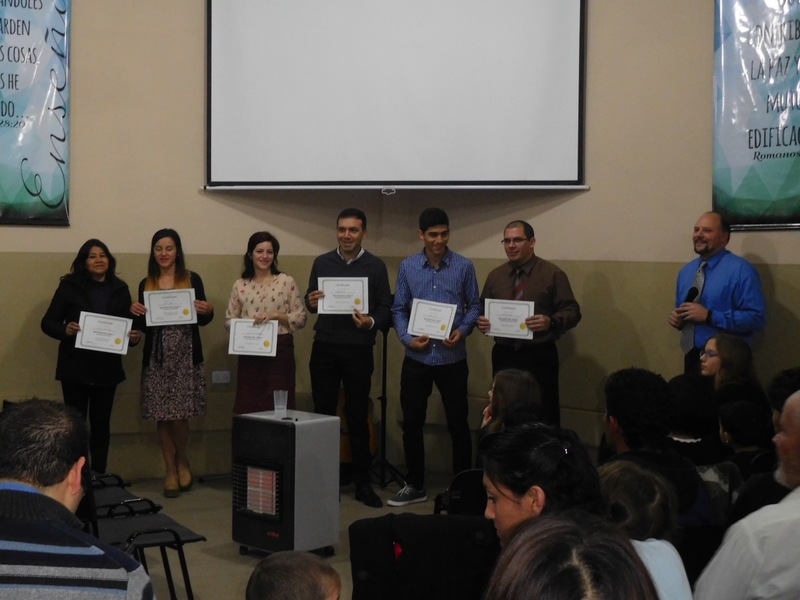 Certificates given to those who completed a certain level in the discipleship program. Many of those present during the anniversary service. 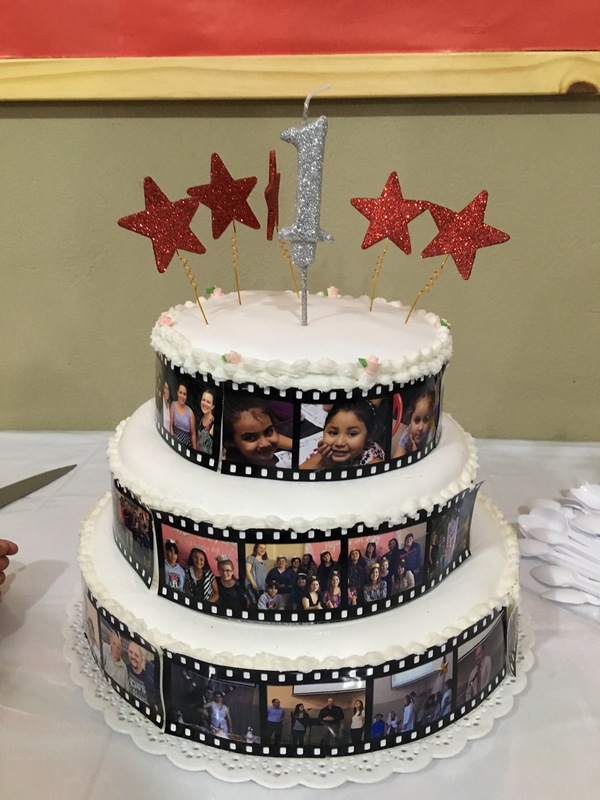 The anniversary cake made by one of our church members. Rachelle with two young women of our church, Micaela and Celeste (left to right). Lucas with two of his friends, Aaron and Dylan (left to right). We would love to share all the photos of the special celebration on here, however we do not have room to do so! 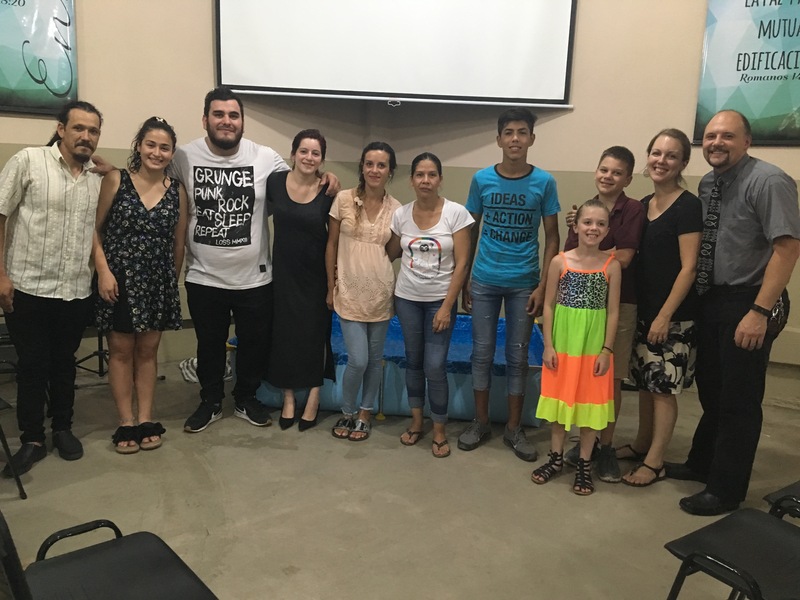 If you’d like to see more, you can search for the church on facebook (https://www.facebook.com/IBRedencion.Catan.Pontevedra/), and then look through the photo album there. Some of the photos are of our church members and others are of visitors, along with members from our “mother church” who came to support us on this special day. Enjoy!